Mazda’s breakthrough SKYACTIV TECHNOLOGY is an innovative automotive engineering strategy that is designed to create a unique sense of oneness on the road. Based on an ancient Japanese principle called Jinba Ittai, or horse and rider as one, SKYACTIV TECHNOLOGY creates a natural, intuitive relationship between vehicle and driver. With each SKYACTIV component working seamlessly together, you’ll also enjoy superior fuel economy, enhanced safety and lower emissions. To create a drive you’ll anticipate day after day. A FOCUS ON FUEL ECONOMY. SKYACTIV engines maximize every drop of fuel. A high compression ratio creates more torque. Multiple SKYACTIV engines to choose from. The SKYACTIV family of engines deliver greater fuel economy and fewer emissions, in a lightweight, responsive design. Every time a SKYACTIV engine is fired up, an immediate connection between vehicle and driver occurs. With multiple engines to choose from, the SKYACTIV line-up is geared to perform. Outstanding horsepower and torque are harnessed to achieve superb fuel economy, agile handling and refreshing performance of the highest quality. An Exhaust Gas Recirculation (EGR) lowers combustion temperature and improves fuel economy. The SKYACTIV-G 2.0 L and 2.5 L engines improve everyday driving by producing more low/mid-range torque, yet has lower fuel consumption and emissions than our previous gasoline engines, resulting in 15 percent increases in fuel efficiency and torque. Cylinder Deactivation is available in 2.5 L engines on select models. JOYFUL DRIVING WITH AN AUTOMATIC TRANSMISSION. SKYACTIV-Drive gives the same thrills as a manual transmission. Transmissions are a touchstone for drivers that give them immediate control of their vehicle. 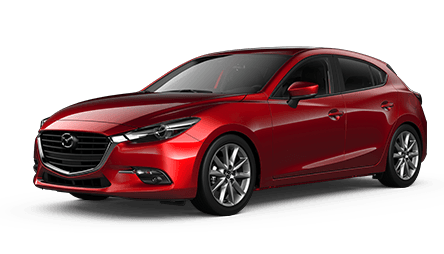 SKYACTIV transmissions are tailor-made to work in harmony with SKYACTIV engines and are designed specifically to deliver superb responsiveness characteristic of the feeling of Jinba Ittai. SKYACTIV transmissions are also specifically designed to enhance fuel economy. 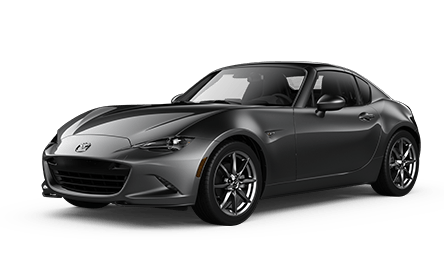 Inspired by the legendary MX-5, the 6-speed SKYACTIV-MT manual transmission is smaller, lighter and stronger than any we’ve built before – promoting better fuel economy. Our high-performance automatic transmission combines the direct feel of a manual transmission with the silky smoothness of an automatic. You get sharper, more responsive acceleration and sporty performance. AJAC’s Best New Innovation Technology for 2017. As a part of SKYACTIV VEHICLE DYNAMICS, G-Vectoring Control (GVC) focuses on how g-forces affect driver and passengers to enhance the feeling of Jinba Ittai. 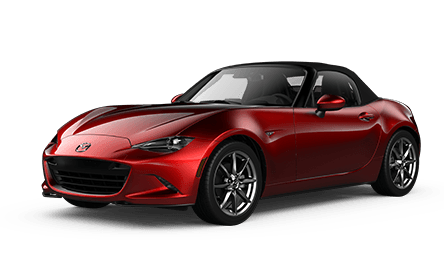 Mazda studies the biomechanical relationship between human and vehicle in order to fine-tune the engineering systems and maximize a smooth interaction between them. Whether cornering or driving in a straight line, fewer steering wheel corrections are needed and fewer g-forces affect driver and passengers. The vehicle behaves more in line with driver expectation, increasing driver confidence and reducing fatigue typically caused by g-forces. GVC focuses on how both vehicle and passengers are affected by turns. The moment the driver starts turning the steering wheel, GVC controls engine torque to decelerate g-forces and shifts load onto the front tires to enhance stability. Used in key areas to promote a responsive, fuel-efficient drive. Creates a sense of oneness between driver and vehicle. Provides superior crash safety performance. In keeping with our Jinba Ittai philosophy, we engineered our SKYACTIV-Body and -Chassis to work seamlessly together. Starting with a dramatic weight reduction over our previous models and using ultra-high-tensile steel in critical areas, we created a vehicle platform that enhances the responsiveness of SKYACTIV engines and transmission, while helping to enhance safe, joyful driving. Through smarter engineering and materials, we focused on body rigidity (for better handling), lightness, excellent crash safety performance and fuel economy. For the basic framework, we adopted the concepts of “straightening,” and a “continuous framework” in which each section functions in a coordinated manner with the other sections of the framework. 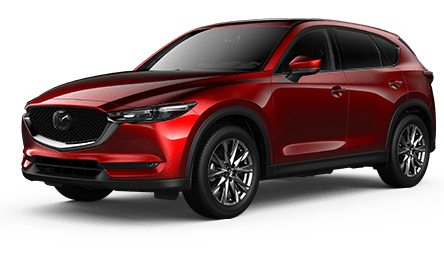 Designed to deliver the responsive thrill that Mazda vehicles are known for, the SKYACTIV-Chassis steering and suspension systems achieve two seemingly contradictory goals – nimble at low speeds, yet stable at high speeds. And stability and responsiveness are both key components of how a vehicle performs when safety matters. Our new KODO “Soul of Motion” design language abounds with graceful, yet energetic, lines. Like the effects of wind or the flow or water, KODO is a unique expression of power and beauty seen in instantaneous motion at the very moment motion begins. It’s a cheetah pouncing on its prey. It’s the moment a sword strikes in the ancient Japanese art of kendo. It’s instantaneous power, speed, dignified tension and sophisticated beauty. And it’s highly seductive. KODO “Soul of Motion” design intricately blends dynamism and emotional appeal, evoking an intelligent, dignified and spirited poise. The MAZDA6-exclusive alloy wheels look better, wear better and – most of all – handle better, with less vibration and greater resistance to twisting forces. Like the technology above them, they perform. No shade of red was good enough. So we engineered a new one with an elaborate three-step painting process. The result is a red so deep, yet so vibrant, it could only be called Soul Red. KODO interior design creates “ultimate athletic space,” focusing on linking ergonomics with basic mechanical functions. The shape, look and feel of a KODO cockpit reveals meticulous craftsmanship and quality materials that heighten the senses and make travelling a very comfortable proposition. The new Human-Machine Interface (HMI) cockpit design has optimum space and easy access to technology tools that enable the driver to focus on the task of driving. Thanks to the available HMI Commander Switch, audio, navigation and Bluetooth® can be controlled intuitively and smoothly using rotary, push and tilt operations. The available leather-trimmed upholstery on the MAZDA6 is so meticulously crafted that its perforated holes are spaced flawlessly to enhance not only the cabin's aesthetics, but its acoustics as well. With KODO design, even passengers ride in “first class.” With generous legroom and scalloped seats, passengers receive the “chauffeur” treatment. In collaboration with industry-academia-government, Mazda has developed the world's first bioplastic that can successfully be employed in car production. Bioplastics are carbon-neutral and reduce the consumption of fossil fuels, thus producing less CO2. Mazda has developed the unique Three-Layer Wet Paint System, the first technology in the world to reduce volatile organic compounds (VOC) and CO2 emissions simultaneously. Keep your eyes focused on the road with the Active Driving Display projects critical driving information like speed, navigation, safety alert and cruise control right within your line of sight. Mazda’s predictive i-ACTIV AWD is an on-demand system featuring sensors that check road conditions 200 times every second. Built to sense, and respond to these conditions, i-ACTIV AWD helps to ensure a more confident drive. The i-ACTIV AWD system uses numerous sensors to determine the driver’s intentions. Is the driver intending to accelerate? How sharply is the steering wheel turned? How much pressure is on the brakes? These and other considerations are taken into account, and determine how the system reacts in order to achieve optimum control. i-ACTIV AWD constantly monitors exterior temperature, wiper operation, the amount of torque required to turn the front wheels and the load on the engine. As a result, the system knows if it’s snowing or raining, if the road is slippery, if the driver is on a hill or attempting to turn. This enables the i-ACTIV AWD system to accurately predict when slippage will occur. i-ACTIV AWD is designed to send just enough torque to the rear wheels to prevent slippage from occurring. By doing this, it provides the traction associated with all-wheel drive, while minimizing the impact on fuel consumption. An ideal split of torque between the front and rear wheels is achieved through the i-ACTIV AWD command module’s innovative 200-times-per-second calculations, allowing for quick and responsive reactions that ensure a better, controlled drive. Direction from the command module lets the i-ACTIV AWD system apply the required torque to the wheels to deliver an exceptionally stable driving experience with better control over acceleration, turns, breaking and slippage. i-ACTIV AWD was designed to deliver exceptional responsiveness and to challenge the convention that an AWD vehicle must be inefficient. In order to deliver the benefits of AWD and excellent fuel efficiency they set out to reduce the weight of the AWD components and to minimize frictional losses. Engineers even studied the way the oil moves through the gears in order to enhance the efficiency of the system. In creating i-ACTIV AWD, engineers carefully scrutinized the design and materials used for every component. The result of these efforts is a 43% weight reduction compared to the previous generation system. 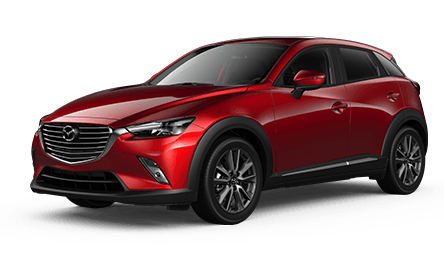 Discover all the benefits of i-ACTIV AWD, available in our 2018 CX-3, CX-5 and CX-9 models. THE ALL-NEW CX-3, WITH i-ACTIV AWD. THE CX-5, WITH i-ACTIV AWD. 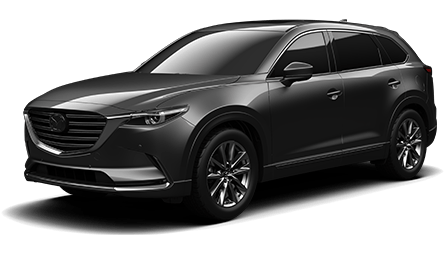 THE ALL-NEW CX-9, WITH i-ACTIV AWD. i-ACTIVSENSE is a new generation of active safety technologies that automatically sense the vehicle’s surrounding area – from nighttime lighting, to the proximity of other vehicles – and help the driver recognize hazards, avoid collisions and reduce the severity of accidents when they simply cannot be avoided. 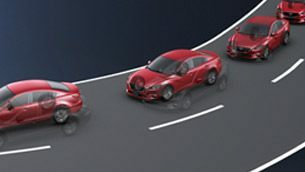 Mazda's Blind Spot Monitoring System (BSM) uses radar sensors to detect objects in your left or right blind spots and then alerts you with a warning light in the appropriate side mirror. The Adaptive Front-lighting System (AFS) provides enhanced nighttime illumination by moving up to 15º in the direction of your turn, allowing you to spot potential hazards ahead. When backing out from a parking spot, Rear Cross Traffic Alert (RCTA) detects any vehicle approaching from the side and promptly alerts the driver. The Lane Departure Warning System (LDWS) senses lane markings on the road and alerts the driver when it predicts the vehicle is going to unintentionally depart from its lane. High Beam Control System automatically switches between high and low beams – helping the driver quickly spot pedestrians and other potential obstructions on the road at night. Detects objects ahead at low speeds and prepares the vehicle to stop by adjusting the brake pads closer to the disc. If no driver action is taken, the system automatically applies the brakes. Mazda Radar Cruise Control (MRCC) monitors the speed of the vehicle ahead and automatically adjusts cruise control settings to maintain a safe headway distance. The Forward Obstruction Warning (FOW) system detects vehicles ahead and alerts the driver to an approaching risk of collision early enough for the driver to take evasive action. Helps avoid or reduce the severity of collisions at mid to high speeds by detecting vehicles and obstacles as far as 200 metres ahead. When a risk of collision is detected, the system slows the car by automatically applying the brakes.